IADLife is “It’s A DESERVING Life”. It has another branch called “It’s A DIGNIFIED Life”. 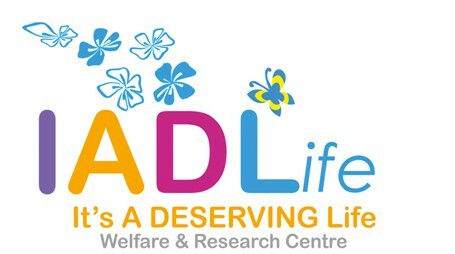 IADLife Welfare & Research centre is founded by Reena Yadav in 2013 in India, Bangalore. IADLife conducts Counselling/life coaching, Energy Healing, Training, and Workshops on various healing modalities and life situation topics. This is to share knowledge and healing solutions pertaining to the mind, body, heart, and soul. All IADLife services are conducted onsite one on one, over the phone, skype, facetime, WhatsApp phone and video call. We share highlights of our in-house research findings on life’s learning through IADLife Next Chapter on IADLife WordPress blog. It is also posted on http://www.facebook.com/IADLife. Please visit us at IADLife.com and www.facebook.com/IADLife and give us an opportunity to share with you all of our activities. We intend that IADLife services cater to the healing of billions of people all around the planet. Billions of people all around the planet are benefitting and love the knowledge we are sharing through IADLife posts and IADLife services. Do let us know how we may serve you. We wish you your highest and greatest GOOD and JOY. We are available on Instagram @iad_life, twitter @IADLife09, and www.facebook.com/IADLife. You can contact us at the IADLife website through contact us page. B. The story behind the conception of IADlife. It started with a counselling session that I was to book for someone else. I had just ventured into the healing studies. While researching about the counsellor and dialing the number of the counsellor I went through a flashback of what was happening in my life. I was barely keeping myself afloat in my job. In my personal life, I had, had losses. My sense of security was diminishing. I had lost my parents one after another within a span of three years. Health wise I was having migraines and weight gain. All that was due to stress and tension because of the worry of my future. Being an amputee, looking for marital alliances using conventional methods was depressing. Newspaper advts., marriage websites, were not helpful to me. It was lowering my confidence in myself. Just as the counsellor picked up the call, reviewing my own life situations, I decided that I will need an appointment too. I booked two appointments that day. My action towards my healing journey had started some time ago. I had been attending workshops. But somehow they did not align with my thinking and thus did not trigger acknowledgment of the effort that I was putting in. The real registration of the genesis of healing journey happened that day. My understanding of healing is that it happens in three steps. Realisation, Acknowledgement, and Registration. After three counselling sessions, I attended a few other the workshops that were recommended by the same counsellor. With each workshops I was learning more and more about this field of healing. Around the same period of time, my driving license expired and I had to apply for renewal. The previous driving license was from the time when I was not an amputee. I was refused the driving licence from two driving schools and RTO I visited. During that time, I was laid off from my job. To have a driving licence I kept inquiring and I got support and help from two quarters. One from my very good friend Aparna and a driving licence middle-man Sammana. I was asked to apply for a ‘disability certificate.’ Since the amputation of my right-upper limb, I had been wearing a scarf on my right side. For the disability certificate, I was to take a picture without it and that was equivalent to stripping. For me, that required tremendous courage and strength. I motivated myself to see the larger goal and used my healing learning to go through the photo session, applying and receiving the disability certificate. Truth be told, it was the most depressing experience. But my support system was helping me go through every step. Aparna and her family played a major role. I got my Driving Licence. On the job front, I was secretly glad that I did not have to go for my corporate job. I very grateful for the security that the job was providing. However, career-wise I was not doing well. To top it all, I was not clear what was I supposed to do next? I was suggested by the counsellor to step-out of the house and apply for the jobs. I bought a small laptop to work on and I use to go to the cafés in and around my residential area. There instead of job search, I use to spend the maximum amount of time going through information available online about the science behind the healing. For the job, I had diligent help, support, and motivation from senior scientists from the previous job, Dr. Achyut Sinha, and Dr. Ugarkar. But, my mindset was such that I was doing the job search only so that I could have something to tell them through the weekly updates. I got a job in Genotypic in next three months, where I was to work on next-generation sequencing. I use to attend the office in the day and spend as much as I could to understand this science in the evenings and late till midnight. I continued attending workshops on my own time and dime. These studies were making a lot of sense and I wanted to do this full time. Ten months after the new job I walked out. I had seen my patterns change. My reporting manager was very encouraging and I was really learning a lot and growing in my new job at Genotypic. Four months later I started IADLife – It’s A DESERVING Life. Being here in IADLife I have realised what I would now like to do differently. I am now a trained Life Coach. I write and publish all my personal revelations too. The initial part of being an entrepreneur had been solitary but has been full of experiences. That has helped me grow in my personal and professional life. My journey continues and now I have many more people who have joined us as service providers, clients, friends, and family. I was introduced to the vast field of healing because of the counselling sessions I had been taking and my personal research. Since then I had developed a keen interest in this field. The more I studied the more I wanted to know. It helped me immensely. Very soon it was very clear to me that these studies, methods, and processes will be useful to many. Right then I envisioned bringing experts in this field from all over to impart this knowledge to all who need and are willing to receive this knowledge. Today that is exactly what we are doing. We have been bringing healing solutions in all areas of life through counselling, workshops, online activities and discussions. I am a researcher and when I started my healing journey, I was working as a scientist in multi-national pharma, AstraZeneca R & D, working on drug discovery in the Bioinformatics department. Delayering and explaining is my forte. I have gained practice in this from my corporate experience. Today, I can comprehensively speak on, discuss and explain any topic on human life and behaviour very comfortably. I am very grateful to IADLife (link https://itsadeservinglife.wordpress.com/2015/05/30/thank-you-iadlife) for my learning and progress in my life. As my journey in life with IADLife progresses I am looking forward to meeting you all, along the way someway, somehow and sometime. You may choose to write to us at iadlife.welfare@gmail.com and/or call us at +91 80 42188074.